FKLI April futures contract surge 10.5 point higher to close at 997 as compare to previous trading session with total 8076 lots traded in the market. FKLI was traded upwards despite most of the regional indices and Dow John electronic were traded weak in the morning trading session. 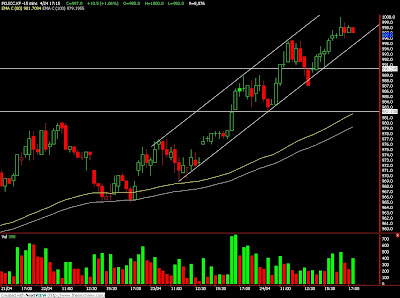 Technically, FKLI was traded within a uptrend channel as shown in the 15 min price chart. We expect FKLI currently riding on wave 3 bull rally but it’s near to tail end as 223.6% and 238.1% Fibonacci projected resistance seen at 1001 and 1011 levels. Traders were advice to take profit in the coming trading session as FKLI might undergo some correction before to go up further. 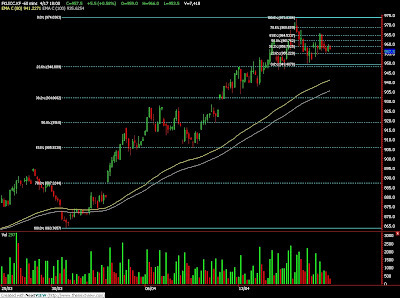 Support levels were seen at 990 and 982 levels. FCPO 3rd month July Futures contract rise marginally RM5 higher to close at RM2585 as compare to previous trading session with 13,981 lots traded in the market. CPO price was traded higher during trading session as crude oil and soybean oil electronic trading were traded strong which lead domino effect on CPO price trading. Technically, CPO surge higher after consolidate around RM2540 and RM2560 range in the morning trading session but encounter great selling pressure around 138.1% Fibonacci projection at RM2633 regions. We expect CPO price still riding on the bull trend provided support levels at RM2535 and RM2322 were not violated during trading session. Traders were advice to hold long position around the support levels while be extra alert around resistance levels at RM 2632 and RM2708 regions. April 24 (Bloomberg) -- Crude oil fell, set for a third weekly decline, as the global recession sapped demand for fuels and OPEC slowed the rate of cuts to its production. Oil snapped three days of gains after International Monetary Fund Managing Director Dominique Strauss-Kahn said yesterday that the economic crisis is “far from over.” The Organization of Petroleum Exporting Countries will trim crude oil shipments by 0.6 percent in the four weeks ending May 9 as output cuts falter, said Oil Movements, the Halifax, England- based tanker-tracker. Crude oil for June delivery fell as much as 56 cents, or 1.1 percent, to $49.06 a barrel, and traded at $49.22 at 1:17 p.m. Singapore time on the New York Mercantile Exchange. Prices have dropped 2.1 percent this week. Oil has declined 67 percent from a record $147.27 a barrel reached on July 11 because of reduced global demand for crude. “Until there is firm evidence that the stimulus package is working and the economy is growing, we will keep waffling around here,” said John Kilduff, senior vice president of energy at MF Global Inc. in New York. Futures have traded between $43.83 and $54.66 a barrel in the past month as surging U.S. inventories coincided with rising equity prices. Earlier this week, the U.S. Energy Department reported crude stockpiles rose for a seventh consecutive week to the highest since September 1990. “The market will continue to consolidate on either side of $50 in the foreseeable future because of inflation worries,” Kilduff said. The euro rose against the yen and the dollar after a report showed an index of European services and manufacturing industries contracted in April at the slowest pace in six months, adding to evidence the economic slump is easing. The euro gained 0.8 percent against the dollar to $1.3115, from $1.3005 yesterday. U.S. crude oil stockpiles rose 3.86 million barrels to 370.6 million and gasoline inventories climbed 802,000 barrels to 217.3 million, the Energy Department report showed. Total daily fuel demand in the U.S., the world’s largest oil consumer, averaged 18.5 million barrels a day in the four weeks ended April 17, down 6.5 percent from a year earlier, according to the department. Nippon Oil Corp., Japan’s largest refiner, will cut fuel production by about 6 percent next month from year-earlier levels as the recession in Japan weakens petroleum demand, the company said today. OPEC will load about 22.27 million barrels a day in the four weeks ending May 9, down 0.6 percent from 22.4 million a day in the month ended April 11, Oil Movements said. In the month to May 2, it cut by 2.5 percent. The Organization of Petroleum Exporting Countries, producer of about 40 percent of the world’s oil, has completed about 80 percent of the 4.2 million barrels of daily production cuts it announced last year to take affect in 2009, according to Oil Movements. That compliance rate is unchanged from the last four reports, indicating that OPEC is not getting closer to its target. The group’s shipments are at a five-year low. Crude oil may decline next week on speculation that U.S. inventories will increase because the recession has cut consumption. Sixteen of 35 analysts surveyed by Bloomberg News, or 46 percent, said futures will fall through May 1. Eleven respondents, or 31 percent, forecast that oil prices will be little changed and eight said the market will rise. Last week, 52 percent of analysts expected prices to be little changed. Brent crude oil for June settlement was at $49.69 a barrel, down 42 cents, 1:17 p.m. Singapore time on London’s ICE Futures Europe exchange. April 24 (Bloomberg) -- Crude oil traded little changed in New York after rising in the past three days as U.S. equity markets gained and the dollar dropped against the euro, bolstering the appeal of commodities. Oil jumped 1.6 percent yesterday after U.S. stocks advanced as better-than-estimated earnings at companies from Marriott International Inc. to ConocoPhillips and EBay Inc. overshadowed falling home sales and higher jobless claims. The decline in the U.S. currency increased demand for crude and precious metals as a hedge against inflation. Crude oil for June delivery traded at $49.69 a barrel, up 7 cents, at 7:24 a.m. Singapore time on the New York Mercantile Exchange. Yesterday, crude futures rose 77 cents to settle at $49.62 a barrel. Prices are up 11 percent this year. Oil, set for a third week of declines, has fallen 66 percent from a record $147.27 a barrel reached on July 11 because of reduced global demand for crude. Futures have traded have traded between $43.83 and $54.66 in the past month as surging U.S. inventories coincided with rising equity prices. Earlier this week, the U.S. Energy Department reported crude stockpiles rose for a seventh consecutive week to the highest since September 1990. The Organization of Petroleum Exporting Countries will load about 22.27 million barrels a day in the four weeks ending May 9, down from 22.4 million a day in the month ended April 11, Oil Movements, the Halifax, England-based tanker-tracker, said in a report yesterday. OPEC agreed at three meetings last year that the 11 members with quotas would cut output by 4.2 million barrels a day to 24.845 million. The members with production targets, all except Iraq, pumped 25.567 million barrels a day in March, according to a monthly report the organization released April 15. Frontline Ltd., the world’s largest supertanker operator, said traders are storing 100 million barrels of oil at sea, enough to supply Europe for five days. The amount is about 25 percent more than Frontline estimated in January and will help buoy tanker rates. About 45 very large crude carriers are storing oil, as well as other smaller vessels, Jens Martin Jensen, interim chief executive officer of Frontline’s management unit, said by phone from Singapore yesterday. Brent crude oil for June settlement rose 30 cents, or 0.6 percent, to end the session at $50.11 a barrel on London’s ICE Futures Europe exchange. FKLI April futures contract surge 17.5 point higher to close at 986.5 as compare to previous trading session with total 8,140 lots traded in the market. FKLI traded higher in the 2nd trading session due regional indices and Dow Jones electronic trading starts to reverse upwards. 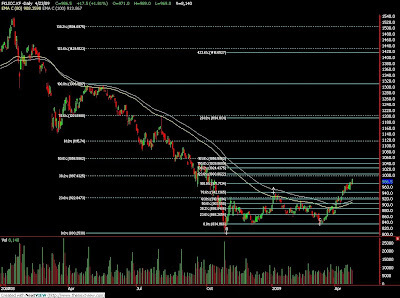 Technically, FKLI seems temporary stopped around 200% Fibonacci retrace levels at 987 regions after long consolidation around support levels at 970 regions. We expect FKLI would starts to retrace in the coming trading if resistance levels at 987 and 1002 were not violated. 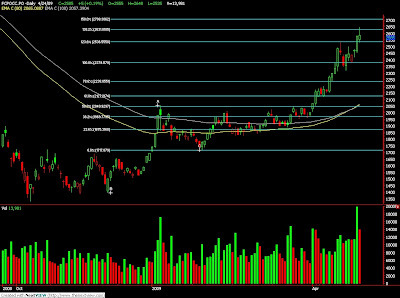 However, FKLI still riding on a bull rally on mid term basis. Traders were advice to only long position provided FKLI manage to breach the resistance levels while support levels seen at 970 and 950 regions. FCPO 3rd month July Futures contract surge RM105 higher to close at RM2580 as compare to previous trading session with 19,855 lots traded in the market. CPO price traded higher fiercely as soybean oil and crude oil overnight and electronic trading were traded firm. Technically, CPO price surge up after long consolidation and tested the hourly trend line around support levels RM2460 regions. We expect CPO price would trade higher in the coming trading session while resistance levels seen at RM2633 and RM2700 regions. Traders were advice to hold long position in the coming trading session while be cautious around support levels at RM2500 and RM2440 regions. - British finance minister Darling will deliver the gloomiest budget in a generation, with borrowing at a record high and the economy shrinking at its fastest pace since World War Two. - China declared its economy has already hit bottom, but wealthy nations saw few signs that the global crisis would end soon in the debt-laden Western world. - Japanese exports showed a rare sign of recovery in March, government figures showed, suggesting the global slump in trade that has pushed the economy into a deep recession may be easing. Reuters correspondent Valerie Parent gave clients the inside track with key data showing that the European Union had allowed the import of more than 500,000 tonnes of wheat into the bloc, clearing the full Q2 volume available under its main import quota. The news confirmed strong competition from other origins, mainly Black Sea, for feed wheat in import-hungry southern Europe and was unmatched by Dow Jones or Bloomberg. PARIS/SINGAPORE, April 22 (Reuters) - Chicago corn and wheat futures were higher as concerns about U.S. planting weather outweighed pressure from a rising dollar. "As wet conditions continue in the United States, disrupting spring sowings, drought in Ukraine and the wider Black Sea region could soon become a focus of attention," French consultancy Agritel said in a note. SEOUL, April 22 (Reuters) - South Korea is considering scrapping its rice import quota to fully open its market earlier than the 2015 schedule, as it anticipates little increase in imports due to high global prices of the grain, the farm ministry said on Wednesday. South Korea is obliged to gradually open its rice market and currently imports only a small amount to meet its import quota under a World Trade Organisation agreement, which will be in place until 2014. HANOI, April 22 (Reuters) - Vietnam has allowed a rice export company to load 53,500 tonnes for East Timor and Africa blocked by the authorities since late February, a trading company official said on Wednesday. The Vietnam Food Association has in total halted the shipment of 120,000 tonnes of rice, including 43,500 tonnes bound for Africa, citing violations of export rules, in a move the shipper has said could lead to serious delays and trade disputes. BEIJING, April 22 (Reuters) - China, the world's largest wheat consumer, imported 27,156 tonnes of wheat in March from Australia, official figures showed on Wednesday. The amount fell from February's imports of 91,476 tonnes but was up from zero in the year-ago period. Imports for the first three months of the year were 121,063 tonnes. China imported no wheat in the first three months of last year. KUALA LUMPUR, April 22 (Reuters) - Malaysian crude palm oil futures rose 1.6 percent to the highest close in a week, rebounding from falls a day earlier as worries about tight global vegetable oil supplies re-surfaced, traders said. "Every day people talk about low stocks and good demand, so whatever news like Russian cutting palm oil imports (is) having no impact," said a trader at a Kuala Lumpur-based brokerage. KIEV, April 22 (Reuters) - Ukraine's 2009 sunflower seed harvest is likely to decrease to 6.0 million tonnes, 8.0 percent less than in 2008, the Agriculture Ministry said on Wednesday. The figure was issued before final sowing statistics were collected and could be influenced by the impact of the financial crisis on farmers. The ministry said Ukraine had harvested 6.52 million tonnes in 2008. KUALA LUMPUR, April 22 (Reuters) - Russia, a rising vegetable oil buyer, may halve imports of palm oil to 420,000 tonnes this year after it doubles an import tariff from June to protect domestic producers, Malaysian traders said on Wednesday. The Russian Dairy Union had earlier said imports of tropical oils were usually above 900,000 tonnes over the last five years, with palm oil comprising the bulk of the shipments. NEW DELHI, April 21 (Reuters) - India, the world's second biggest vegetable oils buyer, is expected to import about 125,000 tonnes of soyoil a month for the next four months, raising annual imports by 9 percent, a leading importer said on Tuesday. Soyoil imports in the oil year to October are projected to rise to 828,000 tonnes, up from 759,433 tonnes, said Sandeep Bajoria, chief executive of Mumbai-based trading firm Sunvin Group, who has headed several trade bodies in the past. CAIRO, April 21 (Reuters) - The Abu Dhabi Vegetable Oil Company plans to import 80,000 tonnes of oils this year to refine and redistribute in the region, a 10 percent rise from 2008, Colin Smith, the company's general manager said on Tuesday. Speaking on the sidelines of an oil and fats conference in Cairo, he said that most of the imports would be palm oil, but the total would also include sunflower and soy oil. Smith said the company would import more vegetable oils to cater for higher demand. LONDON, April 22 (Reuters) - World stocks steadied as a mixed set of key corporate earnings injected caution among investors about the state of the economy, encouraging them to buy the low-yielding dollar and yen. 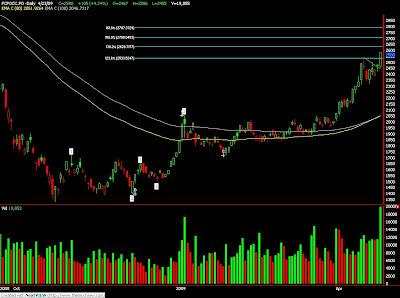 "In the medium term we're trying to find a bottom....," said John Haynes, strategist at Rensburg Sheppard. BANGKOK/SINGAPORE, April 22 (Reuters) - Key rubber producers may review an ambitious plan to take 15 percent of their combined exports out of the market in 2009, hoping China can absorb stocks even during a global economic downturn. The International Rubber Consortium (IRCo), which groups Thailand, Indonesia and Malaysia, starts a two-day meeting in Bangkok on Thursday after agreeing in December to cut exports as cash prices tumbled from a 56-year high around $3 a kg. HAMBURG, April 21 (Reuters) - German coffee roasters are increasing sales as the coffee culture becomes fashionable but a retail price war puts them under huge cost pressure, the head of Germany's coffee industry association DKV said on Tuesday. "Currently brutal retail price competition is taking place," Holger Preibisch told Reuters in an interview. Greener" palm oil: pricey and not green enough? AMSTERDAM, April 21 (Reuters) - A drive to improve the green credentials of palm oil, used in foods and cosmetics but tainted for some by links to deforestation, could make it too expensive for shoppers and may anyway be of limited environmental benefit. The first palm oil certified in the new scheme Round Table for Sustainable Palm Oil (RSPO) unloaded in Rotterdam in November, but some environmentalists said the system was not doing enough to tackle issues such as deforestation and peatlands clearance. April 22 (Bloomberg) -- Soybean prices rose for the second straight day as a jump in Chinese oilseed demand erodes global inventories already forecast to fall to a five-year low. U.S. exporters reported sales of 180,000 metric tons to China for delivery before Aug. 31, the U.S. Department of Agriculture said yesterday. The agency confirmed on April 20 sales of 110,000 tons to China. Inventories in the U.S., the world’s largest grower and exporter, will also fall to the lowest since 2004, the government said on April 9. “China’s appetite for soybeans has been much stronger than most people expected,” said Greg Grow, the director of agribusiness for Archer Financial Services in Chicago. “Prices will have to rise to slow down demand, or carryover supplies will be exceptionally tight” before U.S. farmers begin harvesting this year’s crop in September, Grow said. Soybean futures for July delivery rose 6 cents, or 0.6 percent, to $10.39 a bushel on the Chicago Board of Trade. Yesterday, the price climbed 2.1 percent. The most-active contract has gained 9.1 percent this month. World inventories on Sept. 30 will fall to 45.8 million tons, down from 49.95 million forecast in March and 53.1 million tons a year earlier, the USDA said on April 9. U.S. export sales to China since Sept. 1 have jumped 36 percent from a year earlier. A drought has slashed output in Brazil and Argentina, the two biggest exporters after the U.S. The Buenos Aires Cereal Exchange today lowered its forecast for this year’s soybean harvest by 2.2 percent to 36.2 million metric tons from a week-ago projection because of continued dry weather and lower harvested yields. The USDA estimated domestic stockpiles on Aug. 31, before the next U.S. harvest, will drop to 165 million bushels, down 20 percent from a year earlier. China’s economy will expand faster than forecast this year and next as the government’s 4 trillion-yuan ($586 billion) stimulus package spurs domestic demand and boosts investment, Goldman Sachs Group Inc. said today in a report. China will extend a plan to stockpile 6 million tons of soybeans by two months and buy more rapeseed from growers to help farmers sell crops and boost incomes, the State Council said on its Web site. The government said it will hand out 3 billion yuan ($439 million) to improve hog- and dairy-farming facilities, extend a program that provides subsidized loans to dairy farmers until Dec. 31, and prevent hog prices from sliding further. “There are more people forecasting U.S. carryover will fall to 120 million bushels, based on the pace of export sales,” Grow said. “China’s economy is still growing, and their demand for meat” is driving consumption of animal feed made from soybeans, he said. Soybeans are the second-biggest U.S. crop, valued in 2008 at a record $27.4 billion, government figures show. Corn is the biggest at $47.4 billion. April 22 (Bloomberg) -- Gold and silver advanced on rising demand for a store of value after the International Monetary Fund projected the global economy to contract this year. The IMF forecast a 1.3 percent decline in the world economy, compared with a 0.5 percent expansion estimated in January, and said growth will be slower next year than previously expected. Some investors buy precious metals as a safe harbor in times of economic turmoil. Gold futures for June delivery gained $9.80, or 1.1 percent, to $892.50 an ounce on the New York Mercantile Exchange’s Comex division and was headed for a weekly gain. Last week, the most-active contract slid 1.7 percent, the fourth- straight drop and the longest losing stretch since August. Silver futures for May delivery jumped 24.5 cents, or 2 percent, to $12.305 an ounce on Comex. The price has tumbled 31 percent in the past year, while gold is down 3.5 percent. The IMF projected growth of 1.9 percent next year, down from 3 percent estimated in January. In the 16-nation euro region, there’s “significantly less risk of deflation” than in the U.S, the IMF said in the report. “The market is divided between those who see inflation, due to the massive infusion of liquidity into the financial system, versus those who expect a deflationary environment going forward,” said Gross, who has traded metals for more than three decades. He is also publisher of the Copper Journal. April 23 (Bloomberg) -- Crude oil was little changed in new York after the risk of widening bank losses dragged U.S. equities and other commodities lower. Oil’s two-day climb stalled after lenders including Wells Fargo & Co. said credit markets haven’t recovered yet, pulling the Dow Jones Industrial Average and Standard & Poor’s 500 Index lower in late trading yesterday. U.S. oil stockpiles rose for a seventh week to their highest since September 1990, the Energy Department said yesterday. Crude oil for June delivery fell 18 cents, or 0.4 percent, to $48.67 a barrel in after-hours electronic trading on the New York Mercantile Exchange at 9:40 a.m. in Sydney. The contract rose 30 cents, or 0.6 percent, to settle at $48.85 a barrel after earlier climbing as much as 1.1 percent. Prices are up 9.5 percent so far this year. The S&P 500 Index ended the day down 0.8 percent at 843.55 after rising as much as 1.4 percent. The Dow Jones Industrial Average, which declined 1 percent to 7,886.57 for the day, having earlier gained 1 percent. “There are a large number of financial professionals trading oil who are paying more attention to the equity markets and the U.S. dollar, while ignoring the fundamentals of the oil market,” said Tim Evans, an energy analyst with Citi Futures Perspective in New York. “There is nothing subtle about the numbers” from the Energy Department, he said. Brent crude oil for June settlement fell 1 cent yesterday to $49.81 a barrel on London’s ICE Futures Europe Exchange. Total daily fuel demand in the U.S., the world’s largest oil consumer, averaged 18.5 million barrels in the four weeks ended April 17, down 6.5 percent from a year earlier, the department said. Crude oil stockpiles rose 3.86 million barrels to 370.6 million and gasoline inventories climbed 802,000 barrels to 217.3 million, the Energy Department report yesterday showed. Refineries operated at 83.4 percent of capacity, up 3.1 percentage points from the prior week and the highest since January, the report showed. It was the biggest increase since the week ended Dec. 5. “This probably marks the end of seasonal maintenance outages, but it’s still puzzling that refiners would increase runs that much given how weak product demand is,” Evans said. Global inventories may not show a significant decline before the fourth quarter unless OPEC makes additional production cuts, JPMorgan Chase & Co. said earlier this week. The Organization of Petroleum Exporting Countries agreed at three meetings last year that the 11 members with quotas would cut output by 4.2 million barrels a day to 24.845 million. The group is next scheduled to meet on May 28 in Vienna. Iran will press for oil prices near $80 a barrel at next month’s OPEC meeting, Oil Minister Gholamhossein Nozari said yesterday, according to state news agency Fars. The $80 level is necessary to support investment in new oil fields, Nozari said. April 23 (Bloomberg) -- The dollar may extend its decline against higher-yielding currencies on speculation an unexpected increase in U.S. home prices in February pared demand for the safety of the world’s main reserve currency. The pound traded near a three-week low against the dollar after Chancellor of the Exchequer Alistair Darling said yesterday the U.K. will borrow 269 billion pounds ($390 billion) more than previously forecast and increase income taxes as the worst slump since World War II saps revenue. “An improvement of risk appetite supports capital inflow into the currencies of emerging markets,” said Masashi Hashimoto, senior foreign exchange analyst in Tokyo at Bank of Tokyo Mitsubishi UFJ Ltd., a unit of Japan’s largest lender. This will reduce demand for the dollar and the yen, he said. The dollar traded at $1.3004 per euro as of 8:18 a.m. in Tokyo from 1.3005 in New York yesterday when it touched $1.2886, the strongest level since March 16. The U.S. currency was at 98.09 yen from 98.01 yesterday. The yen traded at 127.56 per euro from 127.48. The Dollar Index, which the ICE uses to track against the euro, yen, pound, Canadian dollar, Swiss franc and Swedish krona, fell 0.5 percent to 86.119 yesterday. U.S. home prices rose 0.7 percent in February after a 1 percent gain in January, the first consecutive monthly increases since 2007, the Federal Housing Finance Agency said yesterday. The pound traded at $1.4483 from 1.4492 yesterday when it lost 1.2 percent as Darling told Parliament the U.K. economy will shrink by 3.5 percent this year, more than twice the estimate in November. The U.K.’s deficit will total 703 billion pounds during five fiscal years through April 2014, compared with 434 billion pounds forecast in November, Darling said in his annual budget statement. This year’s shortfall of 175 billion pounds, or 12.4 percent of gross domestic product, is the biggest in the Group of 20 nations and more than the 12 percent expected in the U.S.
Demand for the dollar and yen may increase on concern government “stress tests” in the U.S. will reveal weakness in banks, sapping optimism the global slump may ease. The Federal Reserve plans to release results of stress tests on banks on May 4. These are being undertaken to determine whether the companies have enough capital to cover losses over the next two years should the recession worsen. The International Monetary Fund said in a forecast released yesterday that the world economy will shrink 1.3 percent this year, compared with its January projection of 0.5 percent growth. The lender predicted expansion of 1.9 percent next year instead of its earlier 3 percent estimate. FKLI April futures contract fall 7.5 point lower to close at 968 as compare to previous trading session with total 8,780 lots traded in the market. FKLI was traded lower during trading session as regional indices and Dow Jones electronic trading plunge during trading session. Technically, FKLI seems encounter great selling pressure around 983 regions. 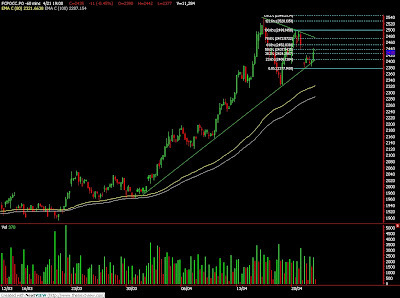 FKLI traded lower after consolidate about 3 consecutive hours around 980 to 975 regions. We expect FKLI would trade lower in the coming trading session provided resistance levels at 983 and 1001 were not violated. 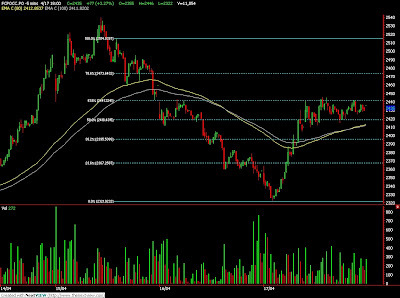 Traders were advice to hold short position around short term resistance levels at 975 while be extra cautious around support levels at 950 and 935 regions. FCPO 3rd month July Futures contract surge RM40 higher to close at RM2475 as compare to previous trading session with 11,396 lots traded in the market. CPO price were traded wild during the trading session due to soybean oil and crude oil electronic trading. Technically, CPO price seems challenge the resistance trend line around RM2470 regions in the hourly chart. Failure to resist buying interest shall indicate bull rally into CPO price trading. 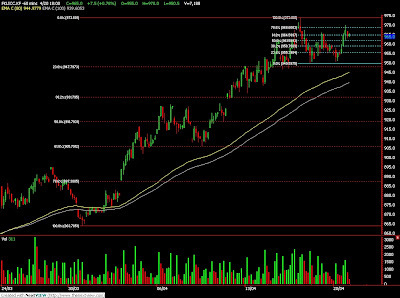 Traders were advice to hold long position once the resistance levels around RM2501 and RM2540 were violated. Support levels were seen at RM2440 and RM2380 regions. PARIS/SINGAPORE, April 21 (Reuters) - U.S. soybean futures recovered some of the previous session's losses, aided by Chinese demand, while slow planting supported corn. "Overall the report can be considered bullish for corn and bearish for soy because some switch from corn to bean could be expected," said Genichiro Higaki, head of proprietary fund management team at Sumitomo Corp in Tokyo. CAIRO, April 21 (Reuters) - Saudi Arabia's Savola Foods will raise its edible oil refining capacity to 400,000 tonnes per year when a new refining unit comes online at the end of 2009, the company's chief executive said on Tuesday. "The new refinery is coming onstream by the end of this year, which will bring our total capacity to 400,000 tonnes," Chief Executive Zouhair Eloudghari said, adding that was a rise of 100,000 tonnes per year. JAKARTA, April 21 (Reuters) - Malaysian palm futures closed slightly lower, recouping most of the early losses thanks to late buying on concerns about tight supplies, traders said. "The thing is the physical side is still tight. Plantations firms are not in selling mood as they prefer to replenish stock until reaching comfortable levels, before selling more aggressively," said a trader at a Kuala Lumpur-based brokerage. MUMBAI, April 21 (Reuters) - India is likely to receive the first consignment of zero-duty soyoil in the third week of May, a senior industry official told Reuters on Tuesday. India last month scrapped a 20 percent duty on imports of crude soyoil in an effort to lower prices and raise supplies. CHICAGO, April 20 (Reuters) - U.S. soybean oil prices at the U.S. Gulf jumped on Monday on an improved outlook for U.S. exports to India and supply concerns in Argentina, the world's top soybean product exporter, traders said. The U.S. Agriculture Department said on Monday that India, the world's second biggest vegetable oils importer, bought 40,000 tonnes of U.S. soyoil. SAO PAULO, April 20 (Reuters) - Brazil's 2008/09 soybean crop was 79 percent harvested by April 18, up 10 percentage points from a week earlier, while forward sales continued to lag far behind last year's, analysts Celeres said on Monday. Harvesting had practically finished in Mato Grosso, Brazil's top soy producing state, where beans are sown and mature earlier than the rest of the soy belt. It has now gathered 99 percent of its crop and should finish in days. LONDON, April 21 (Reuters) - Renewed worries about the U.S. banking sector ushed industrial metals into a second day of losses on Tuesday and dented the market confidence that had driven some commodities up by as much as two thirds this year. "The recurrent theme is high inventories and weakening demand," said Angus McPhail of British-based investment firm Alliance Trust. LONDON, April 21 (Reuters) - World stocks sold off and Wall Street looked set to open lower after a more than one-month long rally lost some of its immediate fizz due to renewed worries about the state of the banking industry. "There are still questions about banks' earnings and provisions," said Bernard McAlinden, strategist at NCB Stockbrokers. "The market is likely to give back some more of its gains. It's as positive as you can be to say that we've seen the lows." April 22 (Bloomberg) -- Crude oil climbed for a second day, following gains in U.S. stocks, after Treasury Secretary Timothy Geithner said the “vast majority” of the nation’s banks have more capital than needed. Crude futures rose as financial shares led U.S. equities higher. Energy prices also increased as the euro climbed against the dollar, bolstering the appeal of commodities as an alternative investment. Crude oil for June delivery rose as much as 38 cents, or 0.8 percent, to $48.93 a barrel in after-hours electronic trading on the New York Mercantile Exchange. It was at $48.76 at 9:20 a.m. Sydney time. The May contract, which expired yesterday, was less expensive than the following months, allowing buyers to profit from storing oil. Crude oil for May delivery rose 63 cents to settle at $46.51 a barrel, after earlier plunging as much as 4.5 percent. “Crude oil is in a rather interesting area right now,” said Stephen Schork, president of Schork Group Inc. of Villanova, Pennsylvania. Yesterday’s contract expiration was behind “a lot of the volatility we’re seeing,” he said. The Standard & Poor’s 500 Index rose 2.1 percent to 850.08 yesterday after dropping as much as 0.7 percent earlier. The Dow Jones Industrial Average increased 1.6 percent to 7,969.56. An Energy Department report today will probably show U.S. crude oil supplies climbed 2.5 million barrels last week, according to the median of 15 responses in a Bloomberg News survey. Inventories rose 5.67 million barrels to 366.7 million in the week ended April 10, the highest since 1990 and 13 percent greater than the five-year average for the period. “We’ve been stuck between the mid-$50s and the mid- $40s,” Schork said. “Prices may move to the low $40s” if stockpiles rise and markets react, he said. The department’s inventory report is due at 10:30 a.m. New York time today. The industry-funded American Petroleum Institute reported after floor trading ended yesterday that oil supplies fell for the first time since the week ended March 6. Stockpiles declined 1.01 million barrels to 370.2 million last week, API said. The report was released at 4:30 p.m. in Washington. “Not much of a draw, but it breaks the seemingly relentless pattern of crude stock builds experienced since early March,” said Adam Sieminski, the chief energy economist at Deutsche Bank AG in Washington. API collects information on a voluntary basis from operators of refineries, bulk terminals and pipelines. The Energy Department requires reports to be filed for its weekly supply survey. Gasoline stockpiles probably dropped 700,000 barrels from 216.5 million the prior week, according to the Bloomberg survey. Supplies of distillate fuel, a category that includes heating oil and diesel, probably fell 1 million barrels from 139.6 million. Iran, the second-largest producer among the Organization of Petroleum Exporting Countries, may back further output cuts when the group meets May 28, the country’s OPEC governor, Mohammad Ali Khatibi, said yesterday, according to a report by the Islamic Republic News Agency. The current oil price near $50 a barrel is “appropriate in the current global economic climate,” Khatibi said. In the longer term, Iran wants prices around $75 to $80 to support the country’s investment in its oil and gas industry. Petroleos Mexicanos, the state-owned oil company, said output fell 6.6 percent to 2.65 million barrels a day in March compared with a year earlier. Mexico was the second- biggest source of U.S. crude oil imports during the first two months of the year, according to the U.S. Energy Department. April 21 (Bloomberg) -- Soybean prices rose for the first time in three sessions on signs of surging U.S. shipments to China, the biggest global buyer of the oilseed. U.S. exporters reported sales of 180,000 metric tons to China for delivery before Aug. 31, the Department of Agriculture said today. Yesterday, the agency confirmed sales of 110,000 tons to China, and an additional 120,000 tons were sold for delivery after Sept. 1 to unknown destinations. U.S. inventories on Aug. 31 will fall to a five-year low, the USDA said April 9. Soybean futures for July delivery rose 21.5 cents, or 2.1 percent, to $10.33 a bushel on the Chicago Board of Trade. On April 17, the most-active contract reached $10.645, the highest since Oct. 1. Soybeans were the second-biggest gainer behind cotton today among the Reuters/Jeffries CRB Index of 19 raw Materials. Exporters sold 808,300 tons in the week ended April 9, double the prior four-week average, the USDA said on April 16. About half of the sales went to China. Shipments of animal feed made from soybeans surged 95 percent to 167,200 tons from a week earlier as output fell in Argentina, the biggest exporter. Production in Argentina, the third-largest shipper of soybeans, will fall 20 percent to 37 million tons this year from 2008, the Buenos Aires Cereals Exchange said last week. Drought and pests will trim yields in some areas by 26 percent, the exchange said. Argentine farmers are limiting sales in a yearlong dispute with the government to lower oilseed-export taxes, boosting demand for soybean meal and vegetable oil from the U.S., Anne Frick, a senior oilseed analyst for Prudential Financial Inc. in New York, said in a report. Before today, the so-called crush margin based on futures, which reflects profit from processing soybeans into animal feed and vegetable oil, climbed 50 percent this year. The USDA forecast on April 9 that companies including Bunge Ltd. and Archer Daniels Midland Co. will turn 1.635 billion bushels into animal feed and vegetable oil in the year ending Aug. 31, down 9.2 percent from a year earlier. “CBOT crush margins are widening out, which adds credence to our case that the U.S. soybean crush may exceed the USDA’s current forecast,” Frick said. “Our estimate is 1.67 billion bushels,” which will tighten U.S. inventories, Frick said. Soybeans are the second-biggest U.S. crop, valued in 2008 at $27.4 billion, government figures show. Corn was the largest at $47.4 billion. April 22 (Bloomberg) -- The dollar may extend declines against major currencies after Treasury Secretary Timothy Geithner said the “vast majority” of U.S. banks have sufficient capital, reducing the appeal of the greenback. The yen was little changed versus the euro and the dollar after a government report showed exports shrank at a slower pace in March. The Australian currency weakened against the greenback before a report economists say will show the annual inflation rate fell to the lowest since the third quarter of 2007, giving policy makers more room to lower interest rates. The dollar traded at $1.2934 per euro as of 9:02 a.m. in Tokyo from $1.2948 in New York yesterday. The greenback touched $1.2889 per euro on April 20, the strongest level since March 16. The yen was at 127.56 per euro from 127.81 yesterday, when it weakened from a one-month high of 126.09. The U.S. currency was at 98.58 yen, from 98.73. Australia’s dollar fell to 70.68 US cents from 71.14 cents. Geithner told a congressional panel yesterday that most U.S. banks have more capital than needed. He also said there are signs of “thawing” in credit markets and some indication that confidence is beginning to return. The MSCI Asia Pacific Index of regional stocks gained 0.4 percent after the Standard & Poor’s 500 Index rose 2.1 percent yesterday. Japan’s custom-cleared exports fell 45.6 percent last month from a year earlier, following a record drop of 49.4 percent in February, the Ministry of Finance said in Tokyo. Worldwide losses tied to loans and securitized assets may reach $4.1 trillion by the end of 2010 as the recession and the credit crisis exact a higher toll on financial institutions, the International Monetary Fund said yesterday. The Federal Reserve plans to release results of “stress tests” on banks on May 4. The tests are being used to determine whether the companies have enough capital to cover losses over the next two years should the recession worsen. FKLI April futures contract surge 10.5 points higher to close at 975.5 as compare to previous trading session with total 9,955 lots traded in the market. FKLI traded higher trading against most of the world indices while Dow Jones plunge during overnight trading. 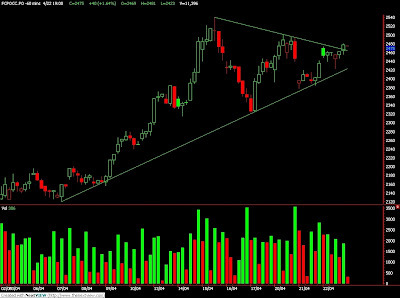 Technically, FKLI reached new high during the trading session after supported above the hourly trend line around 950 regions. We expect FKLI might test next resistance levels at 983 and 1001 regions in the coming trading session provided support levels at 950 and 965 were not violated. Traders were advice to hold short position while put tight stop order around the resistance levels in order to protect trading from huge losses. FCPO 3rd month July Futures contract fall RM11 lower to close at RM2435 as compare to previous trading session with 11,284 lots traded in the market. CPO price was traded higher since opening despite soybean oil and crude oil plunge during overnight trading. Technically, CPO price seems supported above the trend line in the hourly chart. However, we expect CPO price would trade lower in the coming trading session provided resistance levels at RM2452 and RM2473 were not violated in the coming trading session. Traders were advice to hold short position in the coming trading session while be extra alert around support levels at RM2400 and RM2380 regions. MUMBAI, April 21 (Reuters) - Indian soybean, rapeseed and soyoil futures may fall on Tuesday on extended profit-taking tracking weakness in Malaysian palm oil and a fall in crude oil prices, analysts said. Globally, oilseeds and soyoil find use in the bio fuel sector but a fall in crude oil prices lowers the demand from the sector. U.S. crude oil CLc1 had dropped 9 percent in the previous session. However, the losses may be limited on expectation of a supply squeeze, analysts said. The May soybean contract NSBK9 on the National Commodity and Derivatives Exchange ended at 2,706 rupees per 100 kg, down 0.97 percent, in the previous session, while May soyoil NSOK9 closed down 0.84 percent at 504.5 rupees per 10 kg. - Stimulus packages are starting to show results but governments need to be prepared to do more, the head of the Organisation for Economic Cooperation and Development said. - The German economy fell deeper into recession in the first quarter of 2009, the Bundesbank said in a monthly report. - China's economy will grow by 8.3 percent this year, slightly faster than the government's target of 8 percent, despite uncertainties about export demand, the government's top think-tank said. - President Obama says US economy remains under strain. Paul Volcker, Obama's economic adviser, says U.S. recovery will be a "long slog" but rate of decline "is going to slow"
- Bank of Japan Governor Masaaki Shirakawa said Japan's financial conditions remain severe. SINGAPORE, April 20 (Reuters) - U.S. soybean futures rose on Monday as steady Chinese demand and concerns over South American supplies continued to buoy the market. Corn fell nearly 1 percent on better planting weather in the United States and weakening oil prices. SYDNEY, April 20 (Reuters) - Australia's wheat export industry on Monday called for a more transparent shipping allocation system to remove bottlenecks that have delayed vessels loading grain at Australian ports in recent months. The Australian Grain Exporters Association, which represents grain traders such as Cargill Inc, Bunge and Glencore International, said it was willing to work with other stake holders to find a solution. MOSCOW, April 20 (Reuters) - Russian grain exporters activity remained high last week with some cereal export prices stable and others rising slightly, while domestic prices continued to fall, analysts said on Monday. Exporters have reportedly switched part of their activities from ordinary soft food wheat to higher protein wheat and feed barley, the Institute for Agricultural Market Studies (IKAR) said. JAKARTA, April 20 (Reuters) - Malaysian palm futures closed slightly firmer, giving up most of the day's gains, as the market consolidated after last week's supply tightness-inspired rally, traders said. "The market is trying to consolidate waiting for more fresh bullish news to push it up further," a trader at a Kaula Lumpur-based brokerage said. KUALA LUMPUR, April 20 (Reuters) - China, the world's top vegetable oil consumer, is looking to boost its palm oil inventories as stocks have slipped below the usual 400,000 tonne level, traders said on Monday. China, however, would be buying more palm oil products from Indonesia, the world's top producer as regular supplier Malaysia is facing a supply squeeze. SAO PAULO, April 17 (Reuters) - Greater quantities of Brazil's U.S.-bound ethanol exports will be routed through the Caribbean for processing to exempt it from a U.S. import tariff, a Brazilian agricultural analyst said on Friday. The United States has ended a loophole that enabled oil companies to import some ethanol tariff-free with credits they earned by fueling aircraft headed abroad, closing a window through which Brazil was able to export its biofuel fuel more competitively. LONDON, April 20 (Reuters) - World stocks slipped from last week's three-month highs on Monday while government bonds rose as a big increase in troubled loans at Bank of America and this week's key corporate results made investors nervous. Bank of America's first-quarter results topped analysts' forecast but non-performing assets more than tripled to $25.74 billion from a year earlier. Its shares fell more than 7 percent in pre-market trade. "While the reporting season has been better than expected, the results are still very poor indeed, " said Henk Potts, strategist at Barclays Wealth. April 21 (Bloomberg) -- Oil was little changed as U.S. equity markets weakened, a stronger dollar reduced the appeal of commodities and on speculation supplies will rise as the recession reduces demand. Oil dropped yesterday as U.S. stocks tumbled, pulled lower by the biggest drop in financial shares in three months, and as the dollar rose to a one-month high versus the euro, making crude less attractive as a currency and inflation hedge. Crude oil for May delivery fell 17 cents to $45.71 a barrel at 9:15 a.m. Sydney time on the New York Mercantile Exchange. In trading yesterday, crude futures fell $4.45, or 8.8 percent, to $45.88 a barrel, the lowest settlement since March 11. It was the biggest drop since March 2. Prices are up 2.9 percent this year. The May contract expires tomorrow. The more-active June futures climbed 12 cents to $48.63 in early trading. The futures dropped $3.96, or 7.5 percent, to $48.51 a barrel yesterday. An Energy Department report this week is forecast to show that crude inventories climbed from the highest level since September 1990. The dollar strengthened as European Central Bank policy makers disagreed on the measures needed to combat the recession. The U.S. currency rose to $1.2922 from $1.3044 in New York on April 17. Stocks declined on concern that credit losses are growing. The Standard & Poor’s 500 Index dropped 4.3 percent to 832.39. The Dow Jones Industrial Average fell 289.60 points to 7,841.73. Oil prices around $50 a barrel will help the economy recover, according to Mohamed al-Hamli, the oil minister of the United Arab Emirates. The Organization of Petroleum Exporting Countries is concerned about oil demand uncertainty, and maintaining crude prices at reasonable levels is vital, he said. Crude-oil stockpiles rose 2.4 million barrels last week, according to the median of 10 estimates by analysts in a Bloomberg News survey. The Energy Department is scheduled to release its weekly report April 22 at 10:30 a.m. in Washington. Total daily fuel demand averaged in the four weeks ended April 10 was 18.7 million barrels, down 5.2 percent from a year earlier, the Energy Department reported on April 15. Crude supplies climbed 5.67 million barrels to 366.7 million, last week’s report showed. U.S. fuel demand in the first quarter fell to the lowest for the period in 11 years, the American Petroleum Institute said in a monthly report last week. Deliveries of petroleum products, a measure of consumption, averaged 19.2 million barrels a day, 3.4 percent less than during the same period in 2008, the industry-funded API said. The International Energy Agency, the Organization of Petroleum Exporting Countries and the U.S. Energy Department lowered their 2009 global oil consumption forecasts this month. Goldman Sachs Group Inc. analysts predict oil prices will decline to $45 a barrel because of weak demand and rising inventories before recovering to $65 by the end of the year. April 20 (Bloomberg) -- Cash bids for soybeans at export terminals near New Orleans narrowed their premiums relative to futures on the Chicago Board of Trade as U.S. farmers increased sales to take advantage of the highest prices in six months. The so-called spot-basis bid, or premium, for soybeans moved by barge to New Orleans was 36 cents to 47 cents a bushel above the price of May CBOT futures, compared with 43 cents to 47 cents on April 17, U.S. Department of Agriculture data show. The premium for delivery next month fell to 42 cents to 52 cents from 49 cents to 52 cents. The average basis for spot delivery this month has fallen 20 percent to a six-month low today. “After an active week of farmer selling, it appears that nearby needs have been filled,” said Tim Abel, a commodity risk consultant for Mid-Co Commodities Inc. in Bloomington, Illinois. The average cash price in the Midwest on April 17 rose to $10.15 a bushel, topping $10 for the first time since September, Minneapolis Grain Exchange data show. Cash soybeans in Chicago fell for a second straight session after reaching $10.51 on April 16, the highest since Sept. 26. The number of bushels inspected for export fell 34 percent to 15.671 million bushels in the week ended April 16, and was down 26 percent from a year earlier, the USDA said today in a report. Total inspections were the smallest since October, USDA data show. The premium of May futures to the July contract fell to 7.5 cents compared with the April 17 premium of 10.25 cents, the highest this marketing year, data from the CBOT show. “The narrowing in the May-July spread is an indication that the export markets may have enough beans to meet demand,” Abel said. “The demand may improve the next few weeks as farmers focus on planting crops,” rather than selling inventories left from last year’s harvest, Abel said. Soybeans futures for May delivery dropped 32.5 cents, or 3.1 percent, to $10.285 a bushel on the CBOT. On April 17, the contract reached $10.73, the highest since Oct. 2. Last week, the price gained 4.4 percent, the third straight gain. Futures climbed last week as China, the biggest global buyer, increased purchases of U.S. supplies and crop-production forecasts were reduced in Argentina, the third-largest exporter behind the U.S. and Brazil. The USDA said today that 110,000 tons of soybeans were sold to China for delivery before the end of the marketing year on Aug. 31 and an additional 120,000 tons were sold for delivery after Sept. 1. On April 17, the government said that 275,000 metric tons were sold to unknown destinations. The May futures premium relative to soybeans for delivery in November, after the harvest, fell to $1.1525 a bushel, down for a second straight session. The spread reached $1.17 on April 16, the widest this season, after the government said April 9 that U.S. reserve inventories on Aug. 31 will fall to a five- year low of 165 million bushels, down from 205 million a year earlier. FKLI April futures contract rebound another 7.5 points higher to close at 965 as compare to previous trading session with total 7,188 lots traded in the market. FKLI traded higher in the 2nd trading session as regional indices close more firm compare before market closing. 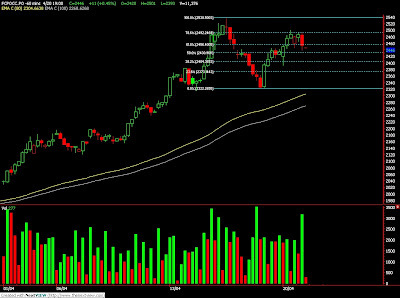 Technically, FKLI resistance levels at 969 was tested during the trading session but seems fails to breach through. We expect FKLI would lower in the coming trading session provided resistance levels at 969 and 974 were not violated. Traders were advice to hold short position in the coming trading session while be alert that supports were seen at 960 and 950 regions. FCPO 3rd month July Futures contract rebound RM11 higher to close at RM2446 as compare to previous trading session with 11,376 lots traded in the market. CPO was traded higher since 1st trading session but consolidate in the 2nd trading session. 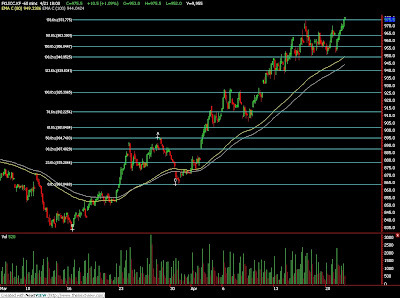 Technically, CPO price topped around 78.6% Fibonacci rebound levels at RM2493 regions. We expect CPO price begin to ride on a bear rally provided resistance levels at RM2500 and RM2540 were not violated in the coming trading session. Traders were advice to hold short position in the coming trading session while alert around support levels at RM2390 and RM2330 regions. MUMBAI, April 20 (Reuters) - Indian soybean, rapeseed and soyoil futures may edge up on Monday on expectation of a supply squeeze and firm Malaysian palm oil but profit-taking after sharp gains in April may limit the gains, analysts said. The May soybean contract NSBK9 on the National Commodity and Derivatives Exchange ended at 2,732.5 rupees per 100 kg, up 0.61 percent, in the previous session, while May soyoil NSOK9 closed up 1.11 percent at 508.75 rupees per 10 kg. At 9:11 a.m., the benchmark July palm oil contract KPOc3 on the Bursa Malaysia Derivatives Exchange was up 1.77 percent at 2,478 ringgit a tonne. April 20 (Bloomberg) -- Crude oil traded little changed after rising on April 17 on concerns about fuel demand as reports this week may show any economic recovery in the U.S., the world’s biggest oil user, will be slow to develop. A U.S. Commerce Department report on April 24 may show orders for durable goods such as refrigerators and computers fell for the fifth time in six months in March, according to a Bloomberg News survey of economists. Crude-oil inventories are at 366.7 million barrels, the highest since September 1990, the Energy Department said on April 15. Crude oil for May delivery was at $50.24 a barrel, down 18 cents, in electronic trading on the New York Mercantile Exchange at 7:37 a.m. Singapore time. The contract rose 35 cents, or 0.7 percent, to settle at $50.33 a barrel on April 17. Prices are up 13 percent so far this year. The May contract expires tomorrow. The more active June future was at $52.31 a barrel, down 16 cents, at 7:37 a.m. Singapore time. Crude oil rose on April 17 on reports that oil refiners in China, the world’s second largest crude consumer, increased their output last month. The country refined 29.4 million metric tons of crude, or about 6.92 million barrels a day, in March, the China Mainland Marketing Research Co. said in a statement April 17. That’s up 0.7 percent from a year earlier. Still, China’s gross domestic product increased 6.1 percent in the first quarter, the slowest pace in 10 years, a sign that oil-demand growth there could be tempered by the global recession. U.S. fuel demand in the first quarter fell to the lowest for the period in 11 years, the American Petroleum Institute said in a monthly report on April 16. Deliveries of petroleum products, a measure of consumption, averaged 19.2 million barrels a day, 3.4 percent less than during the same period in 2008, the industry-funded API said. Angola, Africa’s second-largest producer, will increase daily crude shipments, including the Palanca grade, by 7.3 percent in June as OPEC’s production cuts stall. BP Plc, Total SA, Chevron Corp., Exxon Mobil Corp. and other companies are scheduled to load an average of 1.83 million barrels a day in June, compared with May’s 1.7 million barrels a day, according to loading programs released through today. Angola’s output totaled 1.6 million barrels a day in March, according to a Bloomberg survey of analysts, traders and producers. That’s 103,000 barrels a day over their quota, set by the Organization of Petroleum Exporting Countries. Brent crude oil for June settlement rose 29 cents, or 0.5 percent, to end the session at $53.35 a barrel on London’s ICE Futures Europe exchange. FKLI April futures contract rebound 5.5 points higher to close at 957.5 as compare to previous trading session with total 7,418 lots traded in the market. FKLI was traded wild during the trading session as market is waiting for fresh market leads towards certain directions. 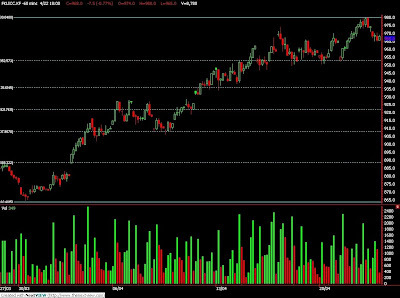 Technically, FKLI seems manage to rebound 61.8% Fibonacci rebound levels at 964.5 regions after temporary supported above 955 regions. We expect FKLI would trade lower in the coming trading session provided resistance levels at 973 and 984 were not violated. Traders were advice to hold short position in the coming trading session while be cautious around support levels at 955 and 947 regions. FCPO 3rd month June Futures contract rebound RM77 lower to close at RM2435 as compare to previous trading session with 11,054 lots traded in the market. CPO price was opened lower but traded higher since opening due firm soybean oil and crude oil electronic trading. Technically, CPO starts to rebound after complete wave 5 projection at RM2330 region despite we expect CPO price would test RM2310 support regions. We expect CPO price would trade lower in the coming trading session provided resistance levels at RM2440 and RM2473 were not violated. Traders were advice to hold short position in the coming trading session while support levels were seen at RM2400 and RM2310 regions.